We are very pleased to announce our first “Veterans Build” event, which begins Nov. 5 with daily repair and clean-up projects that will serve local veterans through Veterans Day, Nov. 11th! We’re actively seeking teams to join us in this special event and help us serve those who served. Our Veterans Build event celebrates community volunteers and corporate sponsors coming together to participate in a week’s worth of building, repair and restoration activities that serve limited-income veteran homeowners while raising funds for our ongoing “Veterans Initiative” program that helps us assist Hillsborough County veterans all year long. SIGN UP NOW! Throughout the Veterans Build week, daily projects will include removing dilapidated fencing and other decaying exterior structural areas such as steps, access ramps, small porches and siding and then reconstruct safe new replacements. Other projects include house painting and landscaping, as well as yard clean up and junk removal. 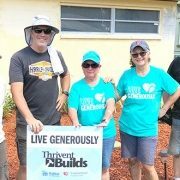 Join the Veterans Build team! We are seeking teams of ten to participate for a day during this seven day event! 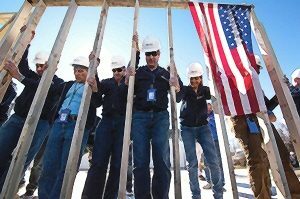 Veterans Build provides a great vehicle for corporate team building activities while providing an opportunity to serve our local veterans who have served our country. We also welcome individual sign-up. 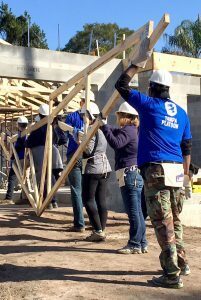 Because Veterans Build is also an important fundraising event, all volunteer participants are required to also raise funds that will benefit our Veterans Initiative program that helps us assist local veterans all year long – well beyond this week-long event. Click here for more event and registration details. About our Veterans Initiative program. 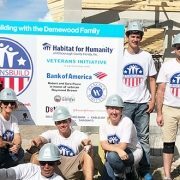 We established our Veterans Initiative program to support the affordable housing needs for military veterans in Hillsborough County as well as to partner with veterans groups seeking opportunities to impact the lives of families and individuals as they reintegrate back into their communities after military service. 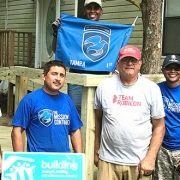 “With almost 100,000 veterans in Hillsborough County alone, we knew that we needed to provide more opportunities to serve our veterans through our homeownership and home preservation programs,” said Nitza Rivera, Habitat Hillsborough Compliance Manager and Veterans Initiative supervisor. Among the program goals of our Veterans Initiative are home construction for qualifying military veterans and their families, as well as providing repair/restoration services to limited income veterans who already own homes. Corporate sponsorships are vital to the success of any fundraising event. 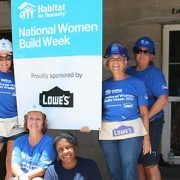 We are hoping to engage the support of businesses and organizations for our Veterans Build event, which ultimately benefits our Habitat Veterans Initiative to address affordable homeownership needs for our local veterans all year long.